George Clooney attended the Serious Fun Children’s Network’s Gala in New York City on Monday night without his wife, Amal Aladmuddin, but with Danny DeVito instead. 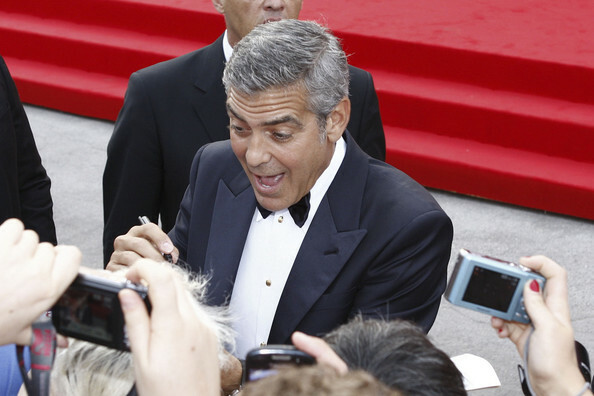 Clooney and DeVito walked down the red carpet together for the event, which had been organized to honor Paul Newman. The late actor was founder of Serious Fun. Clooney was looking slightly more dapper than DeVito, as he wore a two-piece suit and blue tie while DeVito chose to wear a more casual jacket that matched with his trousers. At five-foot-11, Clooney also towered over the comparatively diminutive Danny DeVito, who is only five feet tall. However, despite the absence of his wife, Clooney looked to be having a rather spiffing time with DeVito, as they were seen sharing several laughs as they entered the event. Inside, they were joined by a cavalcade of acting talent, which included the likes of Tom Hanks and Meryl Streep. David Letterman, Carole King, Aloe Blacc, and Gayle King were in attendance as well. Serious Fun took to their Twitter account to upload a variety of images from the night’s excursions. This included one of DeVito and Clooney on the red carpet together. Meanwhile, they also uploaded an image of George Clooney onstage discussing his memories of Paul Newman. This poll was conducted by Bombfell, via USA Today, and it saw the 53-year-old beat Sean Connery to the top spot. One thousand Americans were asked to vote, and they insisted that 65 percent of these people believe that the way a man carries himself is the biggest reason for their stylish appeal. Behind Clooney and Connery came Cary Grant, Elvis Presley, and Frank Sinatra. Will Smith, Brad Pitt, Johnny Depp, Pierce Brosnan/Michael Jackson (tied in ninth), and LL Cool J finished off the top 10. The same poll also voted New York as the most stylish city in the world, ahead of Los Angeles and Miami. George Clooney will next be seen in Brad Bird’s Tomorrowland on May 22, 2015, before appearing in Jodie Foster’s Money Monster, due in 2015, and then the Coen Bros.’ Hail, Caesar! in 2016.